A local artist returns to his roots to find his peace in pottery. Wildwood Green Arts is nestled peacefully in the hills of beautiful Wildwood, and acts as an oasis of ceramics, nature and creativity for anyone looking to take a break from their busy lives to learn. 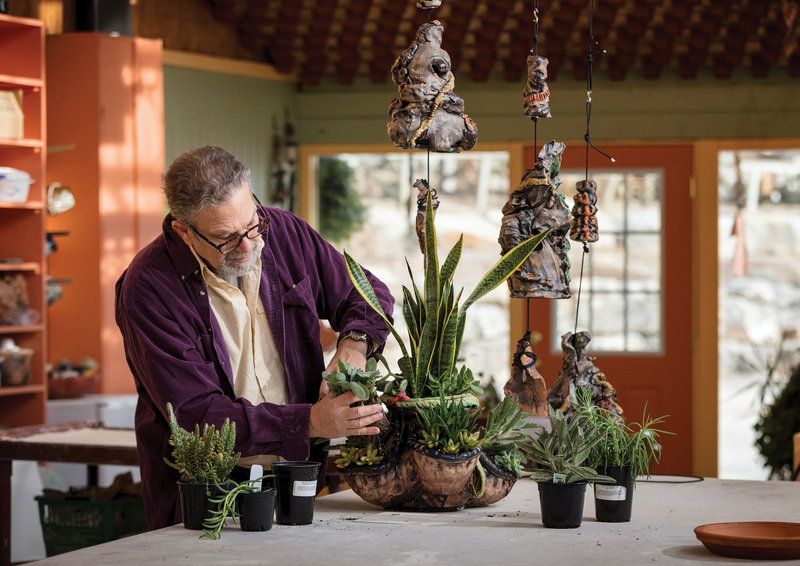 The grounds offer a small plant nursery, a ceramics workspace and a wide selection of Doug’s handcrafted ceramic bells, organic forms, planters and wall hangings. 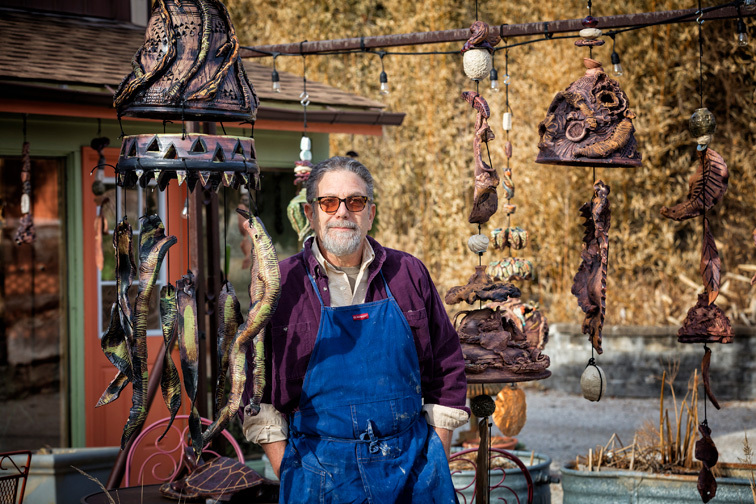 Doug and his late wife owned a successful nursery for 30 years in the same location where his studio stands today. They opened the nursery just as perennial planting and gardening became popular; neither were expecting the small parking lot to overflow with customers, but more and more patrons heard about the quality of their plants until cars began to spill into the street. With his wife’s diagnosis of ovarian cancer in the 2000s, the nursery became more difficult to keep up with. Doug’s experience in real estate kept the pair afloat during the Recession of 2008, but the nursery soon fell into disrepair. After his wife’s death, Doug decided to switch his career focus. He worked for Abengoa Bioenergy alongside his real estate brokerage for four years, analyzing current technological innovations in businesses and curating his own. “I enjoyed working for Abengoa because I could explore and create, but I was a round peg in a square hole. Taking walks at lunch just wasn’t enough time outdoors for me,” he says. 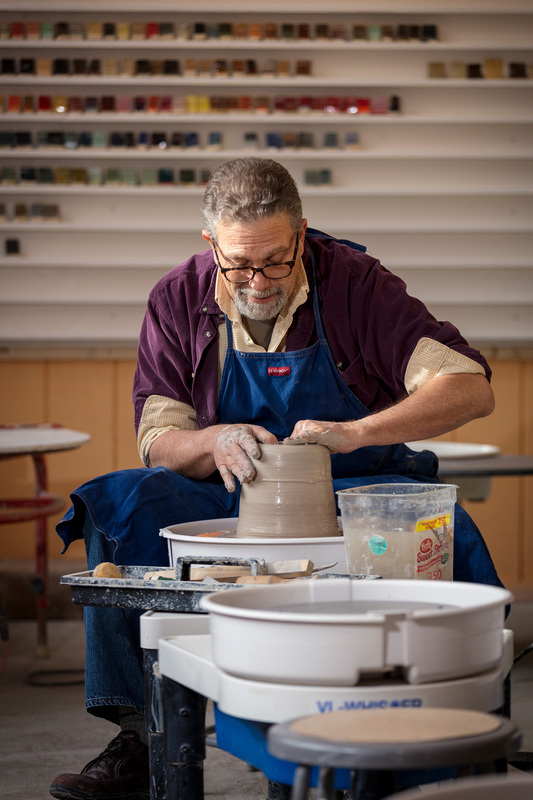 His love for ceramics originated as a student at University City High School and remained a constant part of his life, though only for leisure. 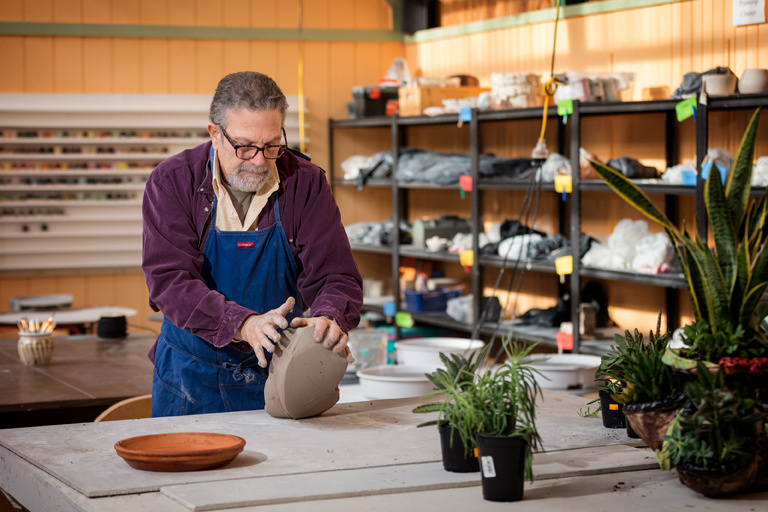 During his time at Abengoa, Doug would spend his weekends working with clay in a local high school art classroom with a small, like-minded group of individuals. “It was a place for us to gather and create. Space and time were all we needed,” Doug explains. Doug makes a wide range of creations, but he specializes in fashioning large outdoor ceramic bells, an idea inspired by Arcosanti, Arizona, an experimental town known for its bronze bell casting business. “I start with a very broad concept of what I’ll be creating, whether it be focused on plants or animals. But the final piece is usually a product of my mood at the time,” he says. His pieces evolve while he’s making them, he explains, but each portion of the bell is related by its texture, color and general aesthetic, though he doesn’t believe a common shape is necessary for a piece to be cohesive. To find out more about Doug's beautiful ourdoor creations and commission work, visit douglasgilberg.com. Additional information about taking classes with Doug can be found on the Wildwood Green Arts website. “My classes are meant to be peaceful and fun, and that’s what students should expect when they come through the door. It’s an art education center and should be a happy space to promote creativity,” he says.